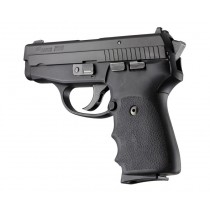 Fits: Sig Sauer P239 357, 9mm or 40 Caliber. (Wraparound with finger grooves). Hogue rubber grips are molded from a durable synthetic rubber that is not spongy or tacky, but gives that soft recoil absorbing feel, without effecting accuracy. This modern rubber requires a completely different molding process than ordinary neoprene and results in a much superior grip. The material used does not come apart or deteriorate and is resistant to all solvents and oils used around firearms. Hogue Grips give you a lasting precision fit and durability that will provide years of dependable service. The flexibility of the materials and molding process has allowed Hogue to produce superior rubber grips with features that out perform all other makes.